This is another one of those comforter dishes, and was made in commiseration of the (anticipated) Scotland defeat by Ireland in the Six-nations Rugby tournament yesterday. Scotland have gloriously lost every single match so far, and are on their way to collecting 'The Wooden Spoon'. Perhaps they may redeem themselves in the Calcutta Cup, the Six-Nation match between Scotland and 'the auld enemy' England, in March. Soften onions. Stir in allspice cinnamon and ginger. Add meat to pan and brown. Stir in lemongrass and stock. Bring to the boil and simmer for 45 mins. Stir in pumpkin/butternut squash and peppers and simmer for 20-30 mins. Stir in garlic, switch of cooker and allow to cook in heat. 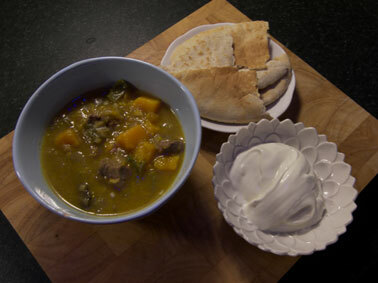 I served this with pitta bread and fresh yogurt. The photo looks nothing like it did in the book; it tasted great, but I ain't no Domestic Goddess!